Product prices and availability are accurate as of 2019-04-25 07:43:21 EDT and are subject to change. Any price and availability information displayed on http://www.amazon.com/ at the time of purchase will apply to the purchase of this product. 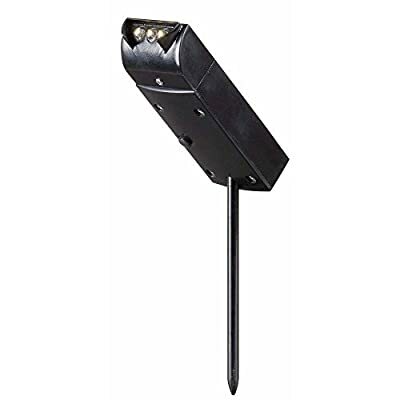 Light up plants, planters, walls, and more with this Kenroy Home 60540 Solar Plant Light - Set of 3. Its unobtrusive design and black plastic construction blends seamlessly into your landscape. Yet its powerful solar light bathes your favorites in light. This set includes three solar plant lights and requires three 0.06 LED bulbs (included). About Kenroy Home Employee-owned Kenroy Home creates a large range of lighting and home decor products. Having recently purchased Hunter Lighting Group, Kenroy Home is now positioned to expand their product lines and take their customer focus to the next level. With an experienced team and advanced equipment, Kenroy Home provides an unparalleled spectrum of products and services. Trained designers and technicians create functional works of art that exceed appearance and performance expectations. Their craftsmanship matches materials and finishes to each application for showroom quality at superior values. Product collections are designed to facilitate mix-and-match coordination. Dimensions: 1.5W x 4H in.. Black plastic construction. Includes 3 attached lights. Ground stake for easy installation. Requires three 0.06 LED bulbs (included).